The Short Version: Single people who own dogs, cats, rabbits, or other animals often want to date someone who will love their pets as much as they do, but they can have trouble finding such a person in their daily lives. 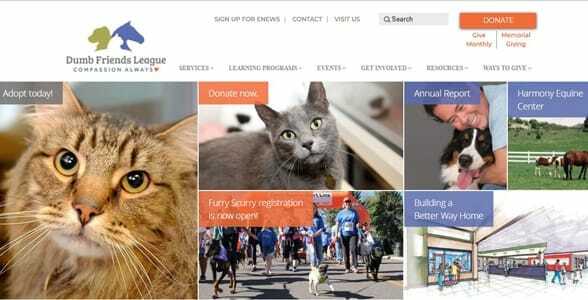 Fortunately, the Dumb Friends League gives metro Denver residents the chance to mix and mingle with hundreds of compassionate animal lovers who regularly volunteer at the animal shelter, cat clinic, and equine center. Over the last century, the independent nonprofit has made a name for itself as the largest community-based animal welfare organization in the Rocky Mountain region, and it’s taken care of over 20,000 dogs, cats, and horses each year. You can attend the Dumb Friends League’s fundraising events or apply to volunteer at one of their locations to meet new people who share your enthusiasm for animal health and happiness. When people hear the name Dumb Friends League for the first time, they often don’t know what to make of it. Is the organization calling itself and its friends stupid? No, of course not! Actually, the word “dumb” in this context isn’t an insult at all — it simply means “unable to speak.” The nonprofit watches out for the welfare of humanity’s silent companions, which includes dogs, cats, rabbits, horses, and other animals. From pet adoption to dental cleanings, the Dumb Friends League provides many valuable services to ensure the welfare of animals in the Denver area. The Dumb Friends League has established a strong network of animal caregivers in Denver. In 1910, a London-born woman got the inspiration to start Dumb Friends League after seeing the good works of Our Dumb Friends League, a UK-based animal welfare group that created a Blue Cross fund for horses wounded in war. 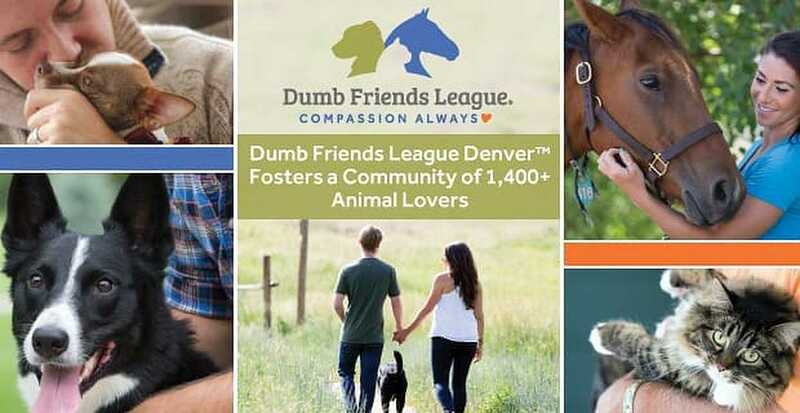 The Founder of Dumb Friends League hoped to emulate the group’s animal-focused mission and make a difference on a local level by protecting the dogs, cats, and horses in Colorado. Her compassion sparked a community effort that has lasted over 100 years. Today, passionate animal lovers combine their diverse skill sets to rescue homeless animals, spay and neuter pets, and educate the general public about the consequences of animal overpopulation. The Dumb Friends League attracts altruistic people who want to give their time and effort to a worthy cause. In the last year, over 1,400 volunteers have put in more than 200,000 hours to make Denver a more pet-friendly and compassionate place. You can learn about the organization’s volunteer opportunities here. The Dumb Friends League supports an array of free and affordable services — including pet adoption, spay/neuter surgery, and behavior training tips — to improve the lives of animals in Denver. The organization’s veterinary clinics have spayed or neutered 8,500 shelter animals prior to adoption in the last fiscal year, and the mobile clinics have spayed or neutered nearly 8,300 pet cats, dogs, and rabbits. An additional 3,400 cats were treated by Solutions, the nonprofit’s stand-alone no-cost cat spay/neuter clinic on Yuma Street. The heartfelt support of the Dumb Friends League encourages pet owners to give their furry friends the best possible care. No matter where you live, you can use the free pet behavior helpline to get expert advice about how to deal with problematic behaviors. The nonprofit’s trained professionals are always happy to give advice and counseling in person, too, because they feel strongly about their mission to save the lives of dogs, cats, horses, and rabbits everywhere. Dumb Friends League CEO Bob Rohde won the 2017 CMVA Distinguished Service Award in honor of his commitment to animal welfare. 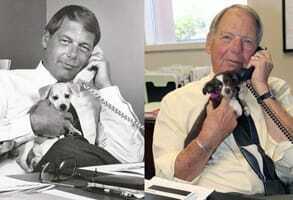 Next month, when Bob retires, he plans to pass the torch to CEO-designate Apryl Steele, who was a veterinarian for 18 years before becoming an integral part of the nonprofit’s humane efforts. Whether they’re running dog training sessions or nursing sick horses back to health, the Dumb Friends League team is constantly working to protect and rehabilitate animals in need. Throughout the year, the Dumb Friends League hosts community-oriented events in Denver and gives people a chance to network with animal lovers while helping a good cause. The Furry Scurry is the most popular event, attracting over 10,000 people and 5,000 dogs from across the state. Since 1994, this annual fundraiser has brought a community of animal lovers together in support of the Dumb Friends League and all they do for homeless animals. 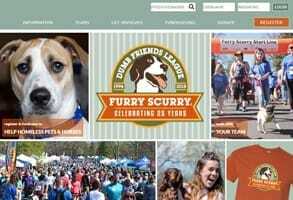 The 25th annual Furry Scurry will take place at Washington Park on May 5, 2018. During the event, individuals and teams of friends, coworkers, and dogs walk two miles, fundraise for incentive items, and shop for wares in the flea-less market, all to raise money for the Dumb Friends League. From the dog agility demonstration to the pet and person look-alike contest, the Furry Scurry offers a fun and dog-oriented atmosphere to meet new people. The Wag ‘n Trail is ideal for outdoor enthusiasts who love going for hikes with a pack of dogs at their heels. This fundraising event takes place on a cool morning in September. From eight in the morning until around noon, dog lovers hike the 1.6-mile trail at Glendale Farm. You can start a conversation with a fellow dog owner as you meander through the scenic public park. If you’re more comfortable indoors, you can always attend a third-party fundraiser hosted by local pizzerias, burger joints, and breweries. Big Daddy’s Burger Bar, for instance, donates 20% of its sales on specific give-back evenings. Maia told us the nonprofit’s Yappy Hours provide a dog-friendly environment where pet owners can hang out with their dogs, have a drink, and possibly dig up a date. “That’s a year-round event that really helps people connect and bond over a love of pets,” Maia said. The Dumb Friends League welcomes visitors of all ages. From 18-year-olds cleaning the kennels to 80-year-olds stuffing envelopes, everyone has something they can do, and every little bit helps. All volunteers commit to coming in at least three hours a week for six months — a two-and-a-half hour orientation lets people know what to expect. Chris Hansen and Jim Slater met in 2013 while volunteering with the Dumb Friends League. They got married in 2016. Chris Hansen had always loved cats, and so in 1991 she started volunteering as a foster for kittens sheltered by the Dumb Friends League. She said she most enjoys watching the newborn kittens grow up into playful cats. During a Foster 101 training session in 2013, Chris met Jim Slater, who had decided to foster cats after losing his two pet cats the year before. Chris and Jim found they had a lot in common — for instance, they were both active and passionate volunteers for the Dumb Friends League — and started dating one another. While the Dumb Friends League’s name may trip folks up at first, once they hear about the animal shelter’s mission and true meaning, they’re often eager to lend a hand. Thousands of Denver’s most enthusiastic animal lovers have joined this kindhearted community by pitching in at the shelter on a weekly basis or attending lively fundraising or adoption events around town. 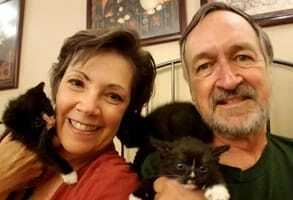 By getting involved with the Dumb Friends League, many singles have made lifelong friendships and relationships with pet owners and shelter volunteers who care about the well-being of animals big and small. Whether you want to foster a kitten or walk dogs, the Dumb Friends League offers plenty of ways to make a difference and have fun while you’re at it. In 2017, the Dumb Friends League increased its placement rate for homeless cats and dogs to 90%. In the coming months, the Dumb Friends League will be working to raise money for an upcoming renovation to its headquarters on Quebec Street. The team’s goal is to raise $20 million and construct a more welcoming and efficient place for shelter animals, active volunteers, and pet owners. The new 110,000-square-foot headquarters will have low-stress transitional areas for rescued cats and dogs as well as a separate pet admission area where pet owners can be counseled on their options and make the best decision for the animal.